With the passing of time, gravity’s pull can displace fat in our face causing deep lines around the mouth, known as nasal labial folds, form the heavy skin on the jawline, called jowls, and shrink the apples of our cheeks, giving us a ‘hollow” look. Injectable fillers gives us the ability to sculpt these features back into our face achieving the youthful appearance we once had. Juvederm, Volbella, Vollure, and Voluma are all injectable treatments that act as filler substances to correct this. 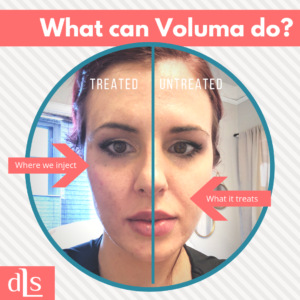 Voluma is for the mid-face/cheek region. Denver Laser Solution medical estheticians are highly skilled and knowledgeable in all injectable fillers and will put together a treatment plan that fits your budget and goals. Enroll now in Brilliant Distinctions to earn points for savings toward Botox and injectable fillers. When men get injectable fillers, it is critical they work with an experienced technician. The reason for this is men have very different facial angles and edges, and as such, they need filler in different areas than women. A technician who understands these structural nuances is vital for the injectable fillers to work as intended. Typically, men come to us when they want to change their appearance, but they have no idea where to start! Common reasons for men wanting to improve their appearance is they are seeking a more masculine or youthful appearance, or just getting rid of that “tired, overworked” look. At DLS, we find that men are comfortable receiving filler treatments, but the key is to look like no work has been done at all! We assess every client to determine the ideal profile and symmetry, as well as addressing individual concerns and goals. Injectable fillers: Learn what can they do for you! What is the difference between injectables — botox vs. fillers? Denver Botox and Fillers are both considered injectables. The difference, however, is that Botox is a neuromodulator, which prevents communication to the muscles, relaxing the area and preventing expression lines. Popular areas for our Denver Botox clients to get injected are the frown lines between the brows, the horizontal lines on the forehead and smile lines around the eyes. Fillers are actually injected into the tissue, “filling up” lines and wrinkles, as well as adding volume to the face in areas such as the lips, nasolabial folds, marionette lines, and cheekbones. You may commonly hear of certain fillers in Denver such as Juvéderm, Radisse, Sculptura, Artefill and now the most popular filler used in Denver is Voluma. Injectable fillers are completely safe whether made of hyaluronic acid or calcium hydroxylapatite, both are biocompatible substances identical to what is naturally found in our body. Are there any side effects to receiving injectable fillers? Fillers are proven to be a safe, effective way to contour and augment the face. Side effects are relatively minimal, the most common being bruising at the injection site along with mild swelling, both temporary in nature. How long will my injectable filler last? Depending upon what type of filler used will determine its longevity. Juvéderm, Juvederm Volbella, and Juvéderm Voluma in Denver are popular amongst our downtown filler clientele. Juvéderm and Volbella are a softer, more jelly-like substance best for augmentation of the lips, under eyes, and nasolabial folds, and with optimal treatment, it can last up to one year. Voluma offers instant volume to the cheek area and because of its thicker consistency, it can last up to two years with optimal treatment. I don't want my face to be fat, why would I want to add volume? Usually, we do not think of adding volume as a beneficial thing, but it can drastically change the way we look. By injecting volume in strategic areas, we can change the shape of the face in a subtle way, similar to how contouring with makeup can change the face. This can make the face look overall thinner. How do I know if fillers are the right option for me? Fillers are a great option for anyone wanting an instant self-confidence boost. Volume loss in our face occurs naturally over time, with the ability to instantly replace those high cheekbones, soften the deep parentheses around the mouth, or erase the vertical lines in the upper lip, we are able to feel better about the way we look. Our Denver “liquid facelift” uses multiple injectable fillers in many areas of the face to make corrections of deep lines and wrinkles, augment cheeks and contour bone structure for an instantly more youthful appearance with no downtime.